If you recall a few weeks ago, I told the story of a hose coming off the heat exchanger of my Hunt Harrier after running the boat at full throttle. The heat exchanger emptied seawater directly into the bilge. Thankfully, the 25-foot boat has an adequately sized Rule bilge pump, and it kept us from sinking until we got back to the dock. But it got me thinking of larger cruising boats, and how they usually come with electric bilge pumps. On powerboats you never see manual bilge pumps. Sailboats usually have both electric and manual pumps. But have you ever wondered if they are good enough? A recent Scuttlebutt post had a piece by Will Keene of Edson, manufacturer of many marine products, including bilge pumps. Will suggests that it is a valuable exercise to put a known quantity of water into your bilge, say 50 to 100 gallons (but not so much to reach the cabin sole). Then make a mark inside the hull at the level where this water sits in the hull, and see how long it takes for the pumps to empty the water out of your bilge. The amount of time that your electric pumps take to empty the bilge will give you the "actual" ability of your pumping system, regardless of the rating of the pump itself. And having marks on the hull to show water levels would be certainly helpful in the event of a leak, as you can see if your pumps are staying ahead of the leak, or if the water is coming in faster than the pumps can handle. As Will says in the article, that might be the difference between a "Pan Pan" and a Mayday." On boats with separated sections of the hull, each should have its own bilge pump. But some builders don't know to do that, or take a shortcut here. It would not surprise me if you looked at buying a 40-footer and finding just a single bilge pump located centrally in the hull. Clearly there is room for improvement here before going cruising, and certainly before going offshore. If this single pump clogs with debris in the bilge, or stops for any other reason, you most certainly have a problem. Part of the spring ritual is to make sure all pump intakes are clear, and the bilges don't have junk that can potentially clog a screened pump intake. In the case of this 40-foot cruiser, it is a really good idea to install several additional pumps, Quality boat builders make sure the various compartments all have means to quickly eliminate any water inside the boat, man-made or otherwise. Go aboard a Fleming 55, for example, and you will find each compartment has its own dedicated bilge pump, wired directly to the electrical system. Other boats, such as older Far Eastern boats, may not have that level of protection. 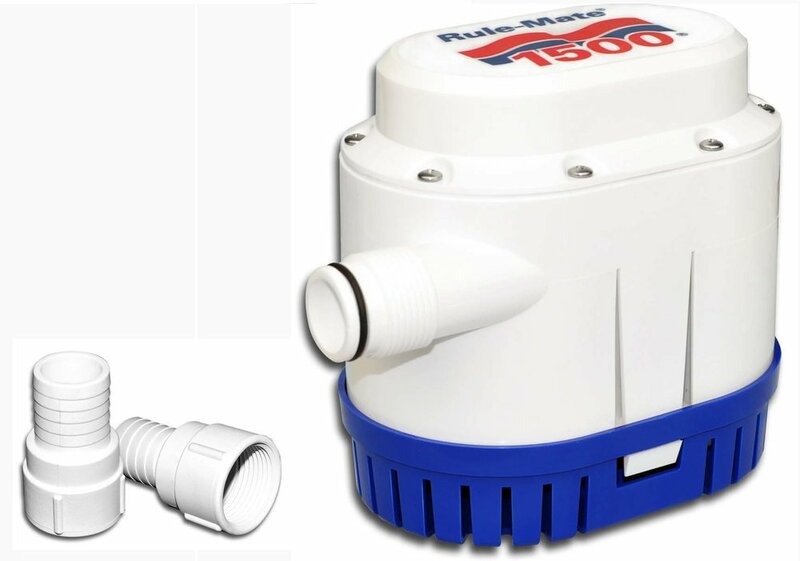 So before heading off to do the Loop or wherever, take a look at your bilge pump(s) and decide if they are enough in terms of rated capacity and number. On a 40-foot or larger cruising boat, a single pump with an automatic switch is not enough. Maybe three pumps are better, and big ones at that. I had water in my Baba 30 sailboat on one occasion, my fault. I don't know the volume of water that came in, but I can tell you my effort to remove the water using the manual bilge pump was painfully significant. The Jabsco diaphragm pump didn't turn on (a terrible design), so I pumped out the water manually. It seemed to take forever, and I was younger back then. I also realized then that the location of the pump was more of a convenience for the builder than a mindful decision of the best ergonomic location for a person to operate the pump handle for any length of time, or even heeled over as well. When I later replaced the original marine head with a new Lavac toilet, a super clever design that used a large volume Henderson manual pump, I installed a Y-valve so it could be used as a secondary manual bilge pump, located at just the right location and height for someone sitting on the head. I bought the boat new in 1985, and there are many Taiwan trawlers and sailboats out there of the same vintage. If you have an older boat, how old are your pumps and hoses? Bilge pumps are among the most important safety equipment on a boat going to sea, and the most ignored. Think about that when you are getting ready for your next cruise. Are they big enough, are the located where they need to be, and can they do the job if the unthinkable happens? If you have the proper number and capacity pumps, you may not need to activate the EPIRB and abandon ship. Save your boat and your crew by being prepared. I feel pretty good that Blue Angel's bilge pump is up to the job. As I never had water in my last couple of powerboats, I assume all were equally protected. But it is definitely on my list of things to check on my next boat. Adding additional bilge pumps is not a difficult project.